Bear Creek Valley Golf Club, in Osage Beach, is a par-72, 6,796-yard layout. The course meanders through 250 acres of colorful Ozark forest, meadows and scenic valleys along Little Bear Creek. The course has zoysia fairways, subtle L93 bentgrass greens and multiple tee settings which will ensure an enjoyable, yet challenging, round of golf. Golf facilities include a driving range, putting green and pro shop. Bear Creek also features a casual restaurant and lounge, best known for its outstanding breakfasts. The Eggs Benedict at Bear Creek, its signature breakfast dish, is very popular with golfers. The restaurant opens daily at 7 a.m.
Bear Creek is open year around. Off-season and twilight rates are available. 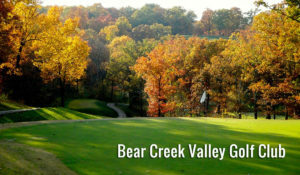 For more information about Bear Creek call the Pro Shop at 573-302-1000 or visit www.BearCreekValley.com .